The battles of Coronel and the Falklands Islands were the first serious engagement between the German and British navies in the First World War. They involved defeat on both sides and the loss of over 3,500 lives. They were fought in the uncompromising spirit of the times, with ships sunk refusing to strike their battle ensigns. Few sailors were able to be rescued from the cold, southerly waters. Yet, as in all such military engagements, there were moments of real courage and honour as well as of misjudgment and good fortune. The outbreak of the war saw the German East Asia cruiser squadron under Vice Admiral Maximilian Graf von Spee at sea in the Pacific. Rather than return to his base in Tsingtau in China where he would have been vulnerable to allied attack, von Spee decided to move towards the Chilean coast to disrupt British and allied commercial shipping. The British priority was to hunt down the German squadron to protect not only the newly opened Panama Canal but also the traditional route to the Atlantic around Cape Horn. At the time, the Falkland Islands, though sparsely populated, provided a safe British harbour with coaling facilities and a radio station, protected only by HMS Glasgow. The Admiralty therefore ordered Rear Admiral Sir Christopher (Kit) Cradock to base his squadron in the Falklands. Recognising the disparity between the ships under his command and the faster, more powerfully armed German ships in von Spee’s squadron, Cradock asked to be reinforced by HMS Defence, a more modern battleship, on station off the coast of Brazil – but the Admiralty dispatched instead the ageing, pre-Dreadnought battleship, HMS Canopus, which arrived in the Falklands in mid-October 1914. Cradock was well aware of the odds against him and that he faced almost certain destruction of his ships. Shortly before departing to hunt for the German squadron, he confided his forebodings to the Governor of the Falkland Islands, Sir William Allardyce. He gave the Governor his medals and a forwarding address for his personal effects, with the words “I shall not see you again”. When Cradock’s squadron on 1 November 1914 came across von Spee’s ships at Coronel, halfway up Chile’s long coastline, Cradock had command only of Good Hope (his flag ship), Monmouth, Glasgow and the converted liner Otranto; Canopus, slowed by boiler trouble, was some 250 miles to the south escorting the British colliers. In contrast, the German squadron comprised two modern battle cruisers – SMS Scharnhorst (von Spee’s flag ship) and Gneisenau with the light cruisers Leipzig and Dresden; the Nurnberg had been despatched north to investigate suspect shipping. At Coronel, the British ships were outmanoeuvred and outgunned. Highly accurate German gunfire sank both Good Hope and Monmouth; some 1600 officers and men were lost, with no survivors from either ship – the battle had been fought in rough weather at dusk. Glasgow escaped, damaged; the Otranto had been ordered to break away earlier. Canopus and Glasgow made it back to the Falkland Islands on 8 November – where eventually Canopus was grounded in Stanley harbour to provide a stable gun platform in case of attack. On 3 November, the German squadron entered Valparaiso harbour in Chile where their crews were welcomed as heroes by the expatriate German population. Von Spee did not share the celebratory mood. He and Cradock were contemporaries and had met during the suppression of the Boxer Rebellion in China between 1898 and 1901. At a dinner given at the German club in his honour that evening, he declined to join a toast to the “Damnation of the British Navy”; instead he proposed a toast to “the memory of a gallant and honourable foe”. The battle of Coronel had actually cost Von Spee dearly. There were few German casualties but his ships had expended a large part of their coal and ammunition stocks. His squadron had sailed vast distances across the Pacific – and now he decided to make for Germany. In doing so, he made the fateful decision to raid the Falkland Islands, both to destroy its wireless station and to obtain further, vital supplies of coal. The defeat at Coronel came as a major shock to Britain, previously so certain of its naval supremacy. It was the first time for over a hundred years that the Royal Navy had suffered such a blow to its pride. The Admiralty ordered the despatch of two fast battle cruisers – HMS Invincible and HMS Inflexible – with the cruisers Bristol, Carnarvon, Cornwall and Kent under the command of Vice-Admiral Sir Doveton Sturdee to reinforce Canopus and Glasgow in the Falkland Islands. Sturdee’s squadron arrived on 7 December and immediately set about re-coaling. Sturdee expected a long hunt to find the German ships. He had, however, arrived only just in time. von Spee arrived close to the Falkland Islands early the following morning, on 8 December. Gneisenau and Nurnberg were detached to make a reconnaissance. Initially, they mistook the plumes of smoke from the British ships getting up steam for the burning of coal stocks. But when they came under fire from Canopus, they were ordered to re-join the squadron. von Spee had no inkling that two British battle cruisers were present and thought that he would be able to outrun the British ships. But once the tripod masts of Invincible and Inflexible were sighted, the German ships turned towards the British to give battle. It was a bright and sunny day with visibility at its maximum; the sea was calm and there was a gentle breeze. By 2130 hrs that evening, the battle was over. Outnumbered, the Scharnhorst, Gneisenau, Nurnberg, and Leipzig were sunk with only Dresden managing to escape. Over 2,000 German officers and sailors were lost, including von Spee with his two sons, Otto and Heinrich. Only 200 or so sailors were saved, including the Gneisenau’s First Officer, Hans Pochhammer, the most senior German officer to be rescued. The search for the Dresden went on until she was found off Mas a Fuera in Chile’s Juan Fernandez Islands in March 1915 and, under British attack, was scuttled. Would things have turned out differently, had HMS Defence been sent down to support Cradock? What if von Spee had avoided the Falkland Islands and slipped silently into the Atlantic or indeed if Gneisenau and Nurnberg had been ordered to shell the British ships whilst they were still getting up steam rather than to re-join the German squadron? Whatever the case, as King George V said to Governor Alladyce during a private audience in 1915, the whole affair had been “a close-run thing”. From today’s perspective, it is the scale of the casualties in these two naval engagements that gives such powerful testimony to the cost in human lives and suffering that the First World War caused. It is good that representatives of both sides – German and British, now allies - can come together today to reflect on the lessons of history and to remember those who fought and lost their lives in the Battles of Coronel and the Falkland Islands one hundred years ago. 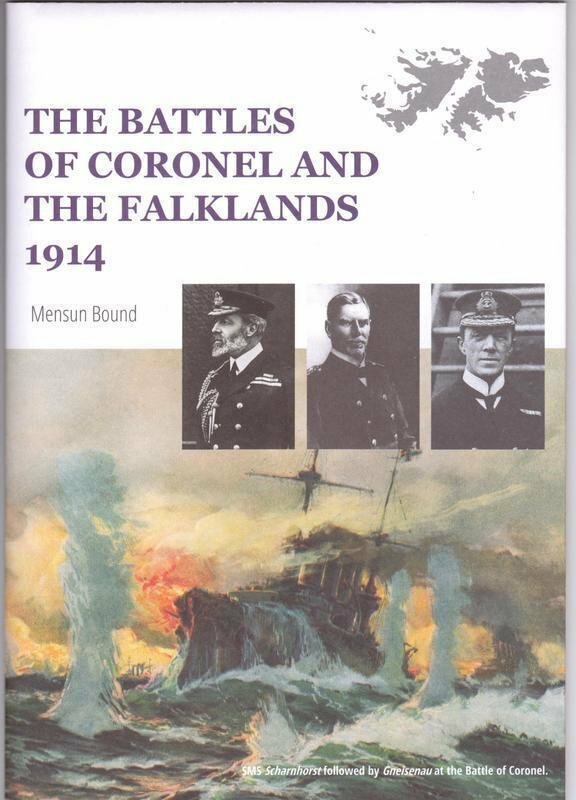 NOTE: A full colour illustrated leaflet on the battles, researched and written by Mensum Bound, was given to all those who attended the service and we have some copies left over. These are available free of charge to UK addresses on receipt of a stamped and addressed C5 envelope from The Hon Secretary FIA, 6 St Annes Road, Shrewsbury, Shropshire SY3 6AU. Contact us if you live overseas and would like a copy.